Josh Einiger reports from TriBeCa. 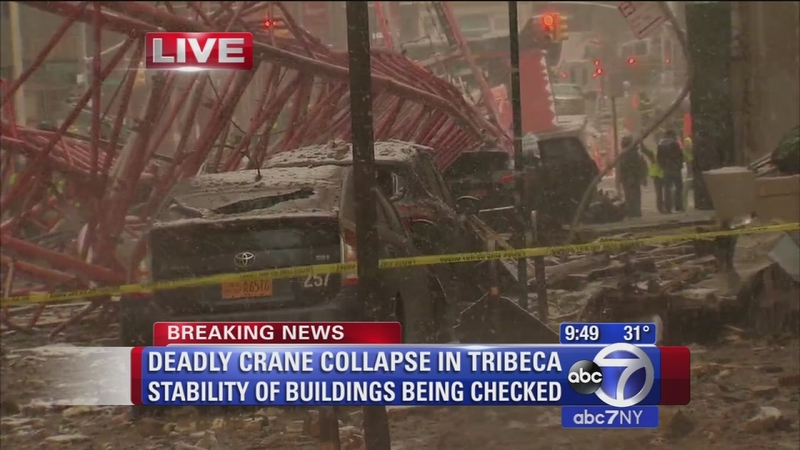 TRIBECA (WABC) -- A crane collapsed in Lower Manhattan Friday morning, crushing a row of parked cars and leaving one person dead and two others seriously hurt. A fourth victim suffered only minor injuries. The massive crane came crashing down at Worth and Church streets in TriBeCa just before 8:30 a.m., clipping at least one building in the process. 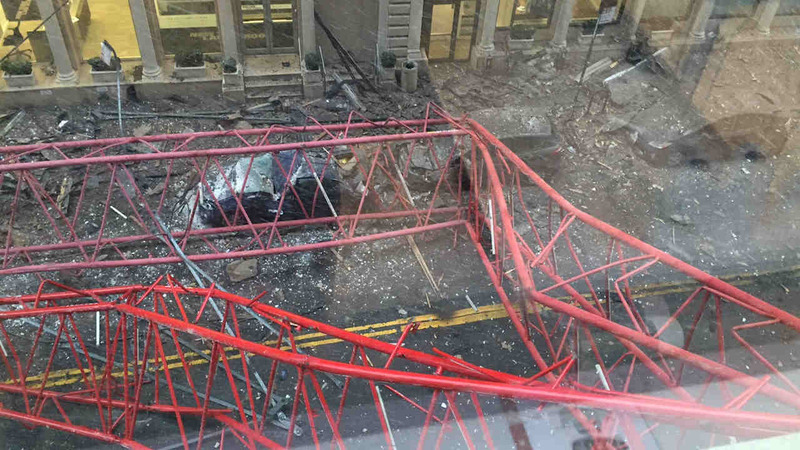 A crane collapsed at Worth and Church Streets in TriBeCa in Lower Manhattan. The construction crane, owned by Bay Crane and operated by Galasso Trucking and Rigging, was previously positioned as high as 20 stories and now stretches across several blocks. David Wichs -- a 38-year-old pedestrian who lives on the Upper West Side -- was pronounced dead at the scene, while two others were rescued from vehicles before being rushed to the hospital. A 45-year-old woman identified as Dawn Kojima, of Nutley, suffered a leg injury, while 73-year-old Thomas O'Brien sustained a laceration to the head. NewsCopter7 over the scene of the crane collapse in TriBeCa. Mayor Bill de Blasio said the crane was being moved into a secure position because of high winds when the incident occurred. The crane was last inspected Thursday morning, and no work was being done at the site Friday. He said crews were keeping people and traffic away from the scene as the crane was being lowered, which likely prevented the injury total from being higher. No workers were injured, and the 56-year-old crane operator is cooperating with detectives and tested negative for alcohol. The force of the collapse caused a water main break at Worth Street and West Broadway and a possible gas main break on the West Broadway side. The FDNY and Con Edison are on the scene working on the gas issue, and spokesperson Sidney Alvarez is warning everyone in the area to be aware of an odor of rotten eggs. Anyone who smells such an odor is urged to contact Con Ed or dial 911. At this point, no elevated gas levels have been reported. 40 Worth Street, which is a large office building. Weill Cornell Medicine has practices in that building and said everyone was evacuated safely. No residential buildings were evacuated. Tim Fleischer is live in TriBeCa with the latest details. Worth Street is closed from Church Street to Hudson Street, while West Broadway is closed south of Canal Street. It appears the crane was working on 60 Hudson Street, a longtime industrial building undergoing renovation to luxury apartments. The crane was parked on Worth Street and had been lifting wood and other equipment to the roof. The plan is to start dismantling the crane Saturday morning. Crews are emptying the hydraulic fluid and fuel from the crane first, which should be ongoing through the early overnight hours. Once they have the crane dismantled, Con Ed and DEP need to access their infrastructure currently underneath the crane to assess the damage to the water main and gas line in the area. Officials hope to have the street open for Monday morning, but it's unclear if that will be able to happen in time.